Wisconsin Gov. Scott Walker had a substantive presence in Texas, even though he was one of the few GOP candidates who had never lived in the state. 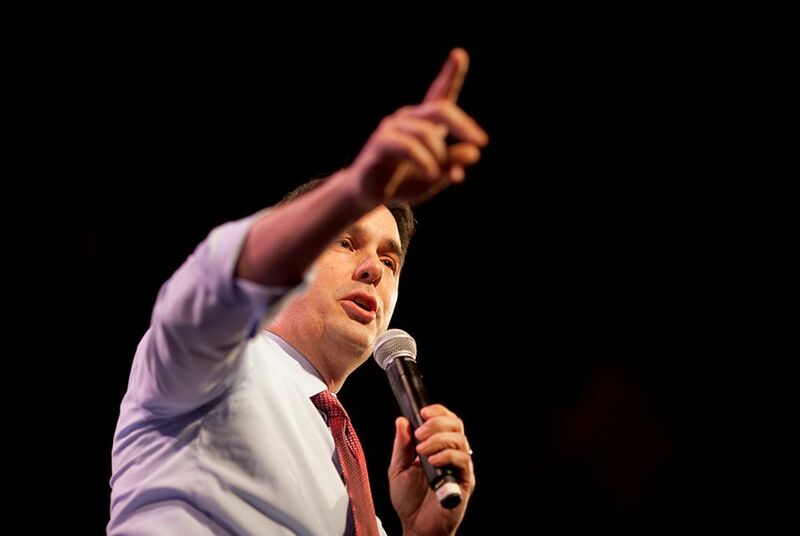 Rival presidential organizations were courting Walker donors even before his campaign confirmed news reports of his exit from the race. WASHINGTON – Wisconsin Gov. Scott Walker shocked Republican politics on Monday when he announced his withdrawal from his party’s nominating contest. Though he was one of the few GOP candidates who has never lived in Texas, Walker's campaign had a substantive presence in the state. So much so that rival presidential organizations were courting Walker donors even before his campaign confirmed news reports of his exit from the race. Texas Republican operatives said Monday that Walker's national fade after the Aug. 6 GOP debate was reflected in Texas, a crucial fundraising state in GOP politics. In the 2012 campaign, Mitt Romney raised more money in Texas than any other state except California, according to the Center for Responsive Politics. Walker's campaign had two high profile, Austin-based Republican operatives — campaign manager Rick Wiley and fundraiser Susan Lilly. Even with that staffing presence, several Texas Republicans speculated Monday afternoon that Walker likely struggled in the face of so many candidates with ties to the state. “I think it’s really hard to raise money in Texas right now because you have so many people with Texas connections, like [former Florida Gov. Jeb] Bush and [Texas U.S. Sen. Ted] Cruz and Perry, when he was in it and [U.S. Kentucky Sen. Rand] Paul,” said longtime former Republican elected official Cyndi Taylor Krier, echoing the sentiment of several Republicans interviewed by The Texas Tribune. Walker had traveled to the Lone Star State at least twice since the beginning of the year. Earlier this month, he hosted a fundraiser and campaign in San Antonio. In March, he attended a Harris County GOP Lincoln-Reagan dinner and toured the Texas-Mexico border with Gov. Greg Abbott. Walker is the second major candidate to drop out of the race. He follows former Texas Gov. Rick Perry, who dropped out last month. Much like Perry, Walker saw his campaign fortunes head south after real estate developer Donald Trump entered the fray. Walker alluded to Trump's affect on the race in his comments Monday afternoon. “Today, I believe that I am being called to lead by helping to clear the race so that a positive conservative message can rise to the top of the field," he said in Madison, Wisconsin. "With this in mind, I will suspend my campaign immediately." Walker mirrored Perry in another regard: While both men struggled financially, they held sway among enough Texas-based Republican donors that as news reports broke about Walker’s exit, other presidential campaigns jumped on the phones to try and lure his Texas financial allies. “I’m shocked, shocked, shocked that Republican governors…aren’t doing better,” said Krier. “I get that people want somebody outside of Washington, I don’t get that they want someone outside of government totally." Instead, Walker dropped out altogether. Walker staffers were not the only ones surprised with Walker’s decision. Cruz reacted to the development Monday afternoon on Fox News. Only hours after the demise of Walker's campaign, Cruz's campaign announced the addition of seven Walker supporters in three key states. The Cruz campaign picked up three former Walker supporters in Iowa, another three allies in Nevada and an additional Walker backer in Georgia.